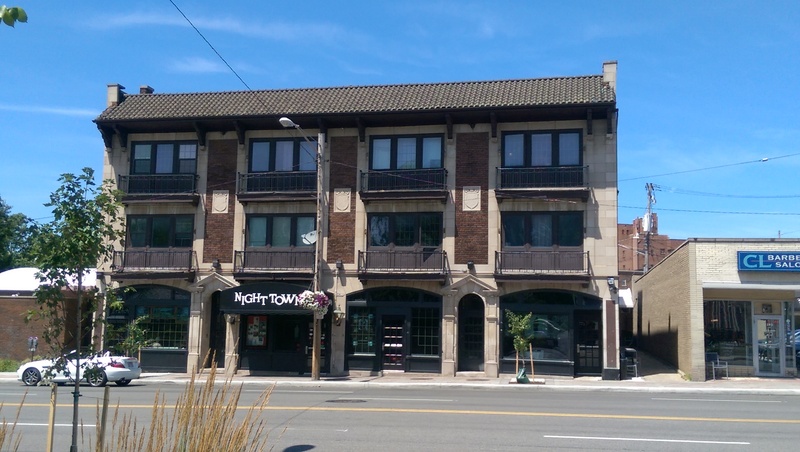 Nighttown celebrated its 50th birthday on February 3, 2015. It is truly a Cleveland institution. Its owner, Brendan Ring, has been the bartender, general manager, and proprietor for 22 years. The food is really good, but you should definitely go when there is live music to really enjoy it. Photo by Yelp user Steve F.
The restaurant/nightclub at the top of Cedar Hill in Cleveland Heights has been voted the #1 Jazz and Blues club in Cleveland for many years now. I’ve seen several top names here, including Manhattan Transfer, Basia, Diane Schuur, and Jane Monheit. 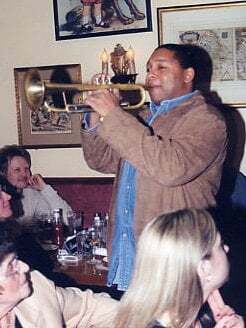 I’ve also heard that some famous jazz folks like Wynton Marsalis and musicians like Stevie Wonder have stopped here after nearby performances for an impromptu jam session. I can’t even imagine how awesome that was. If you come here for a performance be sure to come early, because seating is first come, first served. The room is small and there really aren’t any bad seats in the place, but it allows you to relax and enjoy your meal beforehand so you can focus on the performance. If you are claustrophobic, the sound carries into the dining rooms. Pro tip: You can take advantage of the valet parking, but there is also a parking lot behind the building with parking meters. You can access the lot from Euclid Heights Boulevard. The kitchen is open until 2 a.m. if you are looking for late night eats in the area. The first time I went here I ordered the Private Eye Reuben, which is named after Milan Jacovich, the fictional investigator from the Les Roberts mystery series. The Reuben is only available on the lunch or brunch menus. Nighttown is mentioned in several of the books (Milan lives at what I assume is Cedar and Fairmount and often walks to Nighttown for dinner), so I was excited to check it out. I ordered it with turkey, and it came with Swiss cheese, sauerkraut, and thousand island dressing and was served with French fries. If you do get it with corned beef, you should know that they make the corned beef in-house, and it is not too fatty. 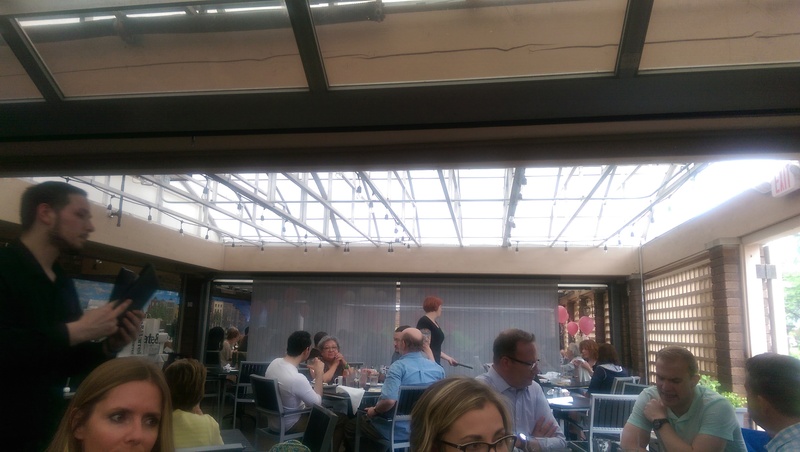 Photo from Yelp user Jodi L.
I usually start my meal here with soup. Both Neal’s Famous Clam Chowder and the French Onion Soup are great choices, although I had to add salt to the clam chowder the last time I ordered it. They always come out piping hot. The Italian wedding soup was also quite lovely during my most recent visit. 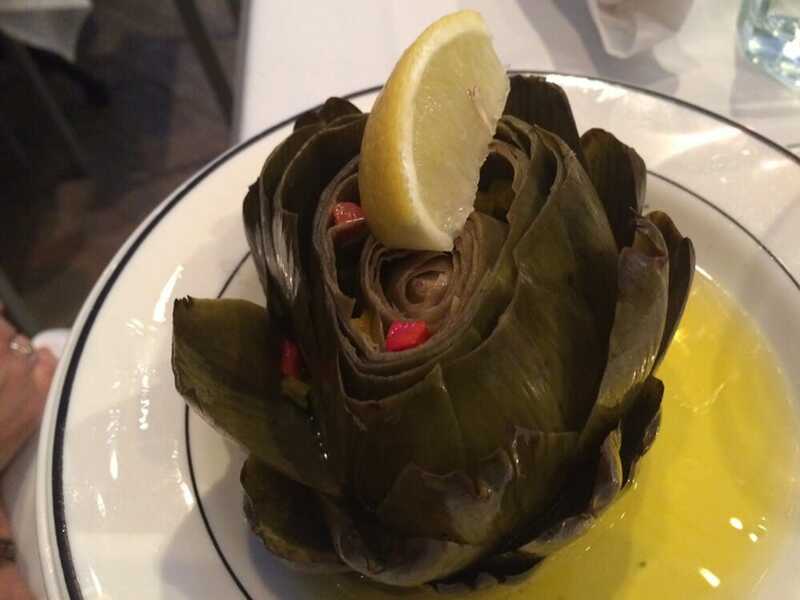 And I also don’t know too many restaurants that serve steamed whole artichokes. It’s served with drawn butter and lemon. 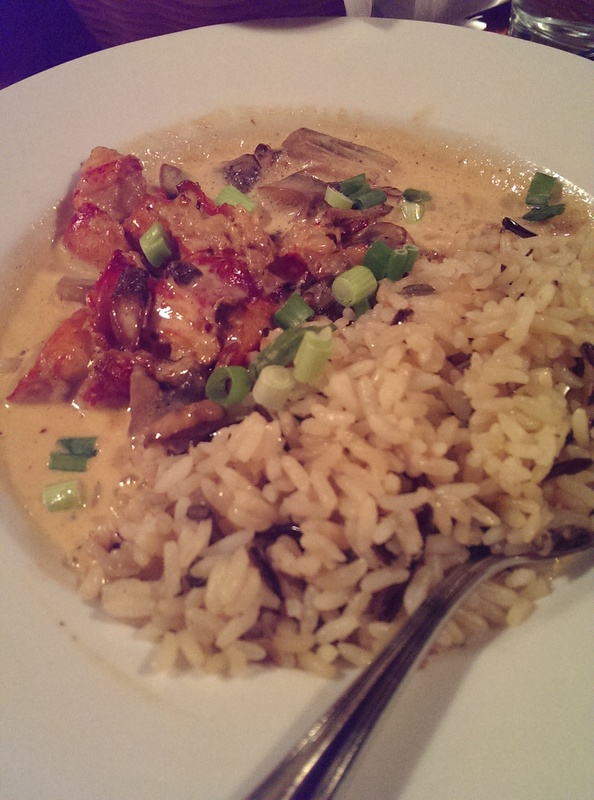 My absolute favorite thing on their menu is the Dublin Lawyer, which consists of lobster meat over a wild rice pilaf in a heavy cayenne butter cream sauce with mushrooms, scallions, and Irish whiskey. When I treated my parents to see Diane Schuur I suggested my father order it, and he loved it as well. Since this is my ‘happy meal’ I rarely order anything else. In fact, I have even ordered it through Delivermefood when I was in the wheelchair for a month a few years back. The lobster is always perfectly poached, and the whiskey cream sauce is a delight. Paired with a salad you have a great meal. 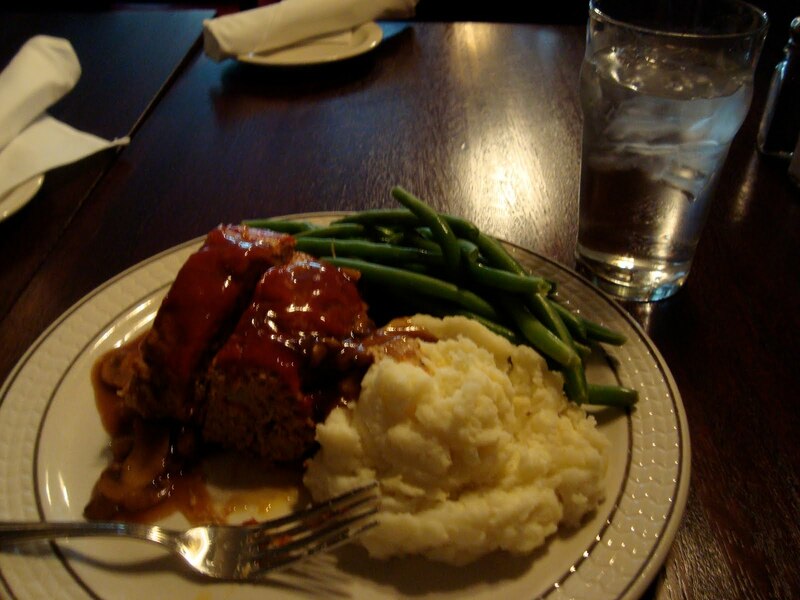 The Veal Meatloaf is fantastic and a great value. It comes with crème fraiche mashed potatoes, fresh vegetables and Madeira mushroom gravy. The last time I had it the veggies were green beans. The meatloaf was very rich from the addition of veal, and I saved half of it for a sandwich the next day. I loved the mashed potatoes and gravy together too. Their Grilled Delmonico is topped with foie gras butter, served with cider braised kale and roasted fingerling potatoes and is a great choice for those of you who are gluten-free. My mother enjoyed hers without the foie gras butter since she also can’t eat dairy. My best friend is a vegetarian. She loves the Grilled Halloumi Kebobs, which feature skewered Cyprian sheep & goat’s milk cheese, served with citrus couscous, steamed asparagus and chive oil. They also have a stuffed squash on their winter menu that she adores as well. I’ve also been here for a private brunch for a celebration for a friend who graduated from grad school. I’ve always heard good things about their brunch, and was not disappointed. On a recent visit I got to enjoy it on the patio/”three season room.” I ordered the Brioche French Toast, which is dipped in Grand Marnier batter and served with Canadian bacon. I enjoyed it a lot. 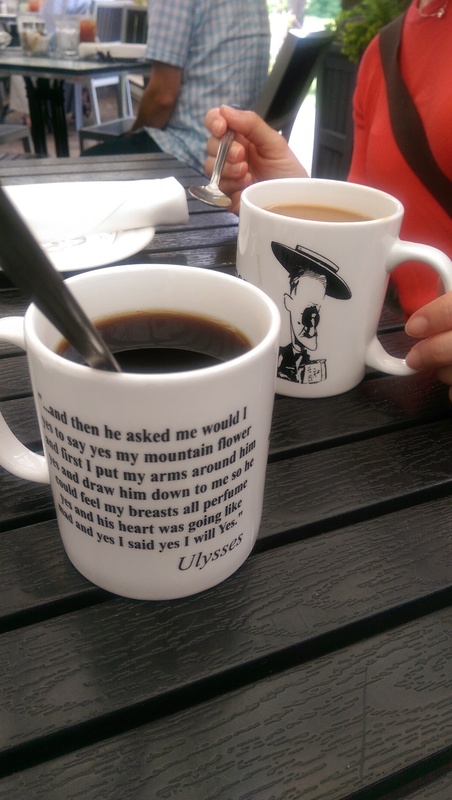 The coffee mugs crack me up. They also have a Lobster Benedict that looks good. Several of my friends ordered it. I only wish I had taken a picture of it. You can order the Dublin Lawyer and several other entrees at brunch as well. The Banoffee pie is a popular dessert. I was not sure what to expect, but I had recently learned about it online and wanted to try it. It features a graham cracker crust with bananas and toffee sauce. It is drizzled with dolce de leche and has a generous dollop of banana whipped cream on top. It was so sweet and filling that I was only able to eat a few bites of it and took the other half home for later.